Shawarma recipe by maham at PakiRecipes.com. 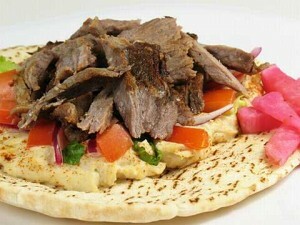 Chunks of grilled lean beef serve on a sandwich-like wrap along with tahini sauce, lettuce and tomato. Combine yogurt, lemon juice, garlic , pepper sauce, vinegar , onion , black and cayenne pepper, mace, and salt . Add meat and marinate overnight. (at least 12 hours-stir a few times) Grill the meat until done or broil in oven. Combine the tahini, garlic , lemon juice, and parsley. Whisk well. Add water if needed. To make the sandwich slice open a pita, spread some tahini sauce on the bread and add some lettuce and sprouts, tomato , onion and meat.